We are living in a time of uncertainty. We are living in an age that, in spite of all of our toys and technology, we can’t answer the seemingly simple questions. We can transplant a human heart from one person into another, but we cannot cure the common cold. We have the technology to put people in space, but we’re still baffled by cancer, AIDS, and Alzheimer’s. We talk about hope and change, yet we have a media that thrives on agenda-driven bad news and fear-mongering. And for any of us who still watch the news, two stories have captivated the headlines for days now: The disappearance of Malaysian Airlines Flight 370, and the events unfolding in the Ukraine. When Flight 370 went missing on March 8, most people assumed it was just another unfortunate plane crash. However, after days of searching without any sign of wreckage, our thoughts quickly turned to something more dastardly: terrorism. Upon the discovery that two passengers were (allegedly) on the plane with fake passports, as well as many questions surrounding the pilot, the idea that the plane had not, in fact, crashed began to surface. Was it possible that the plane had been hijacked for some nefarious purpose? Most of us still remember the feelings we felt in the pit of our stomach when 9-11 unfolded right before our eyes. Could this be the precursor to another 9-11? And while all of the events surrounding Flight 370 were taking place, the world has been watching events unfold in the Ukraine as Russia announced the annexation of the Crimea into the Russian empire. While world leaders have denounced Russia’s leader, Vladimir Putin, and promised sanctions against the nation and it’s leadership, for the rest of us over the age of 30, we feel as though history is repeating itself, and are left wondering if we are seeing the genesis of another Cold War. And all of it is having the same effect: Fear. We’re afraid of flying, afraid of traveling, and afraid for those who are. We’re in fear that history is coming full-circle, and that the days of school children hiding under desks, anti-Russian rhetoric, and threats of nuclear war are back on the table. So what are we supposed to do? How should we conduct ourselves during uncertain times? 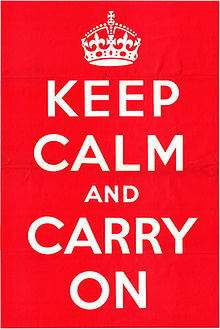 Well… to coin a phrase from a 1939 British motivational poster, we should “Keep Calm”. There is a very short, yet very powerful scene in the movie 42. It is the first time that Jackie Robinson steps out onto the field in a Dodgers uniform. He hears the cheers of the crowd, but then the voices of hate hurling racial epithets at him cut through the cheers. Just as he is beginning to focus on those voices, he hears another sound… he turns his focus to a small section of African-Americans in the grandstand, cheering him on. A slight smile comes across his face, and the hate-filled cat-calls fade into the distance. The hateful cries were still there. What made the difference? We can choose to focus on the negatives. We can choose to focus on our past experiences and perceptions. We can listen to the panicked cries coming from the agenda-driven media-elite. We can choose to ignore the fact that, for every airplane that experiences tragedy, hundreds of thousands of flights take place without a hitch. We can barricade ourselves up in our homes with our TV remotes and smartphones, isolating ourselves from the world. We can arm ourselves with Hope. We can put on the full armor of God. We can stand boldly in the face of adversity and, while the world falls apart around us, shine the light of Jesus on our signs that read “Hope Found Here”. We can reach out to those around us, and make a difference. Hope is life. Hope is real. Hope is contagious. So, what’s it going to be? You have the rest of the day (and your life) before you… where is your focus going to be? How are you going to change the corner of the world that you are touching? With Jesus as your Hope… they are.